This week I am focusing the mini missions around items that maybe aren’t so easy for you to let go of. These missions are not physically challenging because as usual the effort of collecting and setting the item aside once chosen takes but a matter of minutes. We can usually identify these items easily enough. The challenge of course is the deciding whether or not to let them go but this is something you can be thinking over as you go about your other daily tasks. For each mission I will include a link to a previous post that may be helpful in your decision making process. Good luck and happy decluttering. Monday – Declutter a sentimental item that, if you are honest with yourself, you never pay any attention to. Tuesday – Declutter something you are only keeping out of guilt because it cost you much more than it proved useful to you. That is you paid a lot for something and now you feel obliged to keep it even though you hardly if ever use it. Wednesday – Declutter something you are only keeping because you feel obliged to because it was given to you by someone else. Thursday – Declutter something that you have aspired to making use of for a long time but never have. Friday – Declutter something you keep for security reasons. That is simply because you fear you might need it or wish it back someday. Letting go is also about letting go of the falsehood that you ever needed them in the first place. 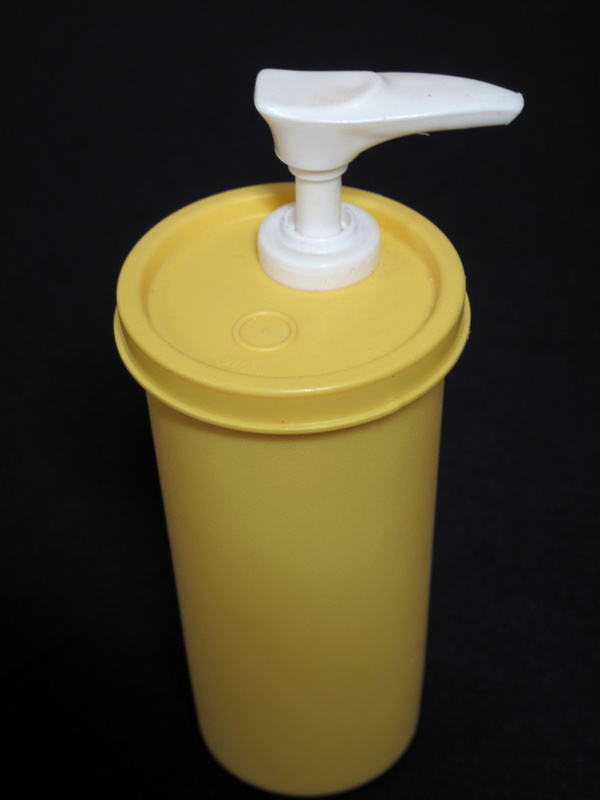 Today’s decluttered items and the solution to Saturday’s “What am I?” quiz is a Tupperware mustard dispenser. Jane, who left the first guess was the closest to the mark I believe. She said “Institutional-size mustard container?”. She had the mustard container part right. Many other said was it a soap dispenser which in a way is also right because it has been used for that purpose at one point. Gah! I should have known exactly what that was down to the brand seeing how I delcuttered and thus donated that very same mustard container just last year! Sheesh! I knew it looked eerily familiar but just couldn’t quite bring myself to realize why! Funny how the unconscious brain works. On a side note, it’s absolutely baffling to me when I look back on my “big list of decluttered items” & can barely even remember the items we have decluttered thus far. I try not to look at that list (except to add newly decluttered items to the list) because I’m half ashamed of it all & half gob-smacked at how I can barely remember the items on the list. I keep thinking I need to just stop updating that list but it does go a long way in reminding me of where I once was & why I no longer want to go back down that rabbit hole! Hi Jane, I would keep adding to the list because it is probably inspiring you more than you think. I would also say don’t be ashamed of where you once were, you weren’t there alone that’s for sure. Just be proud of how far you have come. 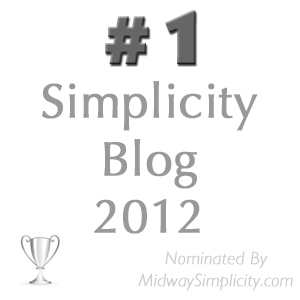 josh from becoming minimalist has a beautiful post about celebrating where we are rite now. it is the little steps that gets us there. i notice you are decluttering lots of plastic items. Great mini missions for the week! Thanks for the challenge! Good ideas all – sounds like a difficult but empowering week! Hi Andréia, carefully use the vacuum cleaner and or a microfibre cloth to clean the books. As for choosing which to keep and which to declutter stick to the rule of choosing the easy ones first. Then hopefully the joy of seeing some gaps in the bookcase might spur you on to decluttering more. Good mini’s. Spent the weekend sick. Moving slow. Won’t be doing much this week. That’s no good Deb J. You must have put the kibosh on yourself when you told us last week how much your health has improve and how much weight you have lost from living a healthier lifestyle. I hope you feel better soon. I bought a book at a jumble sale a few weeks ago. It was called The Art of Conversation. I started reading it this week and I can tell you if listening to the authors conversations was as hard going as reading her book there is no way I am going to take advice from her. Call me ignorant but I believe one can overuse fancy words and “clever phrasing” to the point where it all become to hard to comprehend. I read several pages and it was doing my head in. I didn’t give up there though as I thought maybe the reading would become simpler once she was past the introduction and into the nitty gritty so I turned over a few chapters and read some more. No, still doing my head in. I will be donating that book to the library tomorrow when I return my other books. Colleen, I had an asthma episode at S’ that then pushed me into allergic bronchitus. Got into some dust and cat hair that she didn’t know was there. I have come across books like that. I “read at” one last night and finally just skimmed it. In this one the conversation wasn’t such fancy words as much as it was the characters conversations were this “cutesie” stuff that I found very unlikely. I guess not all books can be good. Grin. Hi Colleen, just want to say your site is my most popular, I always look forward to reading it. You give me so much inspiration. I am up to 742 items now (and many of those are “a bag of …”) and I keep on finding more to declutter. What a joy to have an empty shelf, or drawer! I think you are wonderful to be able to think of new posts to write about, just amazing, well done! Well thank you Janetta. I appreciate your kind words. I have to say some days it is a struggle to come up with a new angle of the same theme but something always pops up. I am a voracious reader and for years, no matter whether I liked the book or not, I continued to read it to the end. Several years ago, I realized that my time is too valuable to do this. Now, if I can’t get into the book by the 3rd chapter, I put it in the donate pile or return it to the library. There are too many other wonderful books out there just waiting for me to find them that I can’t be bothered trying to finish something I don’t like. This weekend, I plan to redo one of my bookcases in my bedroom. My husband knocked against it and one of the shelves (overloaded, of course) dropped down to the shelf below it and it needs to be reset. In order to do that, I have to onload that shelf and the ones below. A good time to resort and donate more things. A good decluttering weekend for me. I may not declutter what is in the mini-missions this weekend but will certainly find other things to go. A very Happy Thanksgiving to one and all. Thanks everyone, for all the helpful hints and great ideas you share.